Go is not the best game. It is the only game. The Game Of Go is a beautifully elegant, deceptively simple game that easily outstrips chess for complexity. Chess can be thought of as a stylised, abstract version of a single battle, wherein two sides each aim to capture the other player's centre of being, the king. Go, on the other hand, is an entire war, with two sides trying to gain and retain control of territory. At any given moment in a single game there may be half a dozen fire-fights and several more struggles for position, all contributing to the overall success or failure of a campaign. At the end of the game the territory held by each side is totalled, the number of prisoners held added to that, and the winner is the one with the larger score. Because the result gives a margin of victory and not simply a win/lose, one player may offer a handicap to the other. When two players are of only slightly differing skill levels, the stronger can offer a number of prisoners to the other, thus creating the expectation of a close score. Wider skill levels are also catered for by a method of handicap stones - pieces initially placed on the board favouring the weaker player. If two players have a ranking difference of 4 points, the weaker player starts with 4 stones on the board, giving him or her an advantage to make up the skill difference. Games between players are then close fought battles with the stronger player fighting hard to overcome the initial advantage given to the weaker player. Computer programs to play chess have been with us for some time and have been steadily increasing in strength. Most notably, Deep Blue plays at the level of the very strongest players in the world, and even programs running on modest home computers can compete with strong club players. Programs to play Go, however, are still regularly thrashed by moderate club players. At its simplest, the branching factor (number of possible moves at each turn) for chess is around 35, whereas for Go it's in the hundreds. 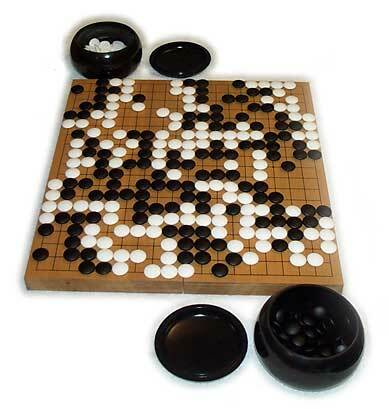 The Go board is larger, 19x19, and yet the result of a territorial struggle on one side of the board can still subtly influence the balance of power on the other. There is also no real concept of material. Evaluating a board position requires searching through current fights, and deciding which bits of the board belong to whom. Many articles have been written about this and there's little point in repeating that material here. Although primarily popular in the Far East, Go retains a small but active following in the West. There is almost certainly a Go club in your area. Let Us Know if you would like more information, or send mailto:go@solipsys.co.uk and I'll help you if I can.